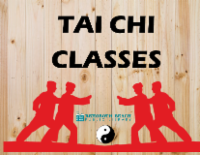 Beginning April 15, the library will begin offering a six-week started course on the ancient art of Tai Chi! Certified instructor Gary Rosenblum will be teaching the ins and outs of how to view your body's movement as meditation. Great for beginners! Classes are $10 per session, but patrons have the option of paying only $50 up-front for all six sessions.